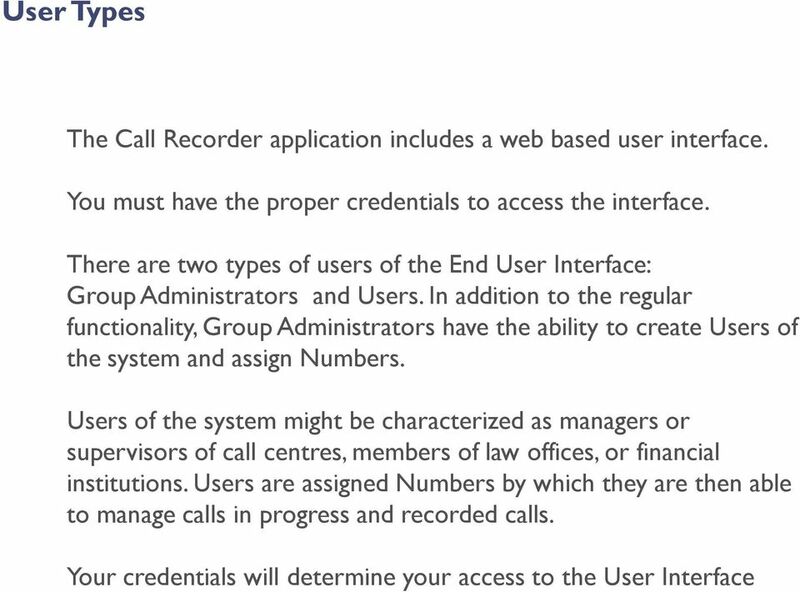 Download "Call Recorder User Guide"
3 Group Administrator Since the Group Administrator is essentially the administrator of the Call Recorder, they have additional features available to them. 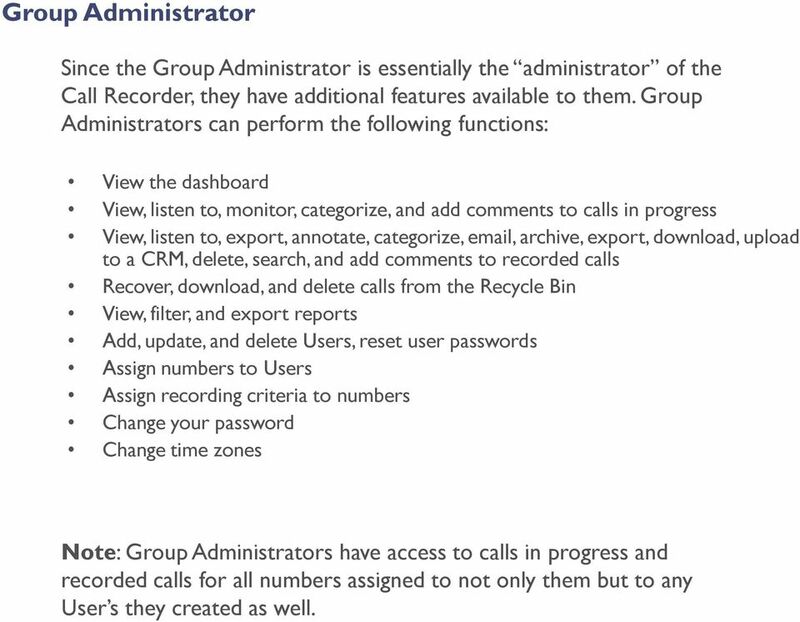 Group Administrators can perform the following functions: View the dashboard View, listen to, monitor, categorize, and add comments to calls in progress View, listen to, export, annotate, categorize, , archive, export, download, upload to a CRM, delete, search, and add comments to recorded calls Recover, download, and delete calls from the Recycle Bin View, filter, and export reports Add, update, and delete Users, reset user passwords Assign numbers to Users Assign recording criteria to numbers Change your password Change time zones Note: Group Administrators have access to calls in progress and recorded calls for all numbers assigned to not only them but to any User s they created as well. 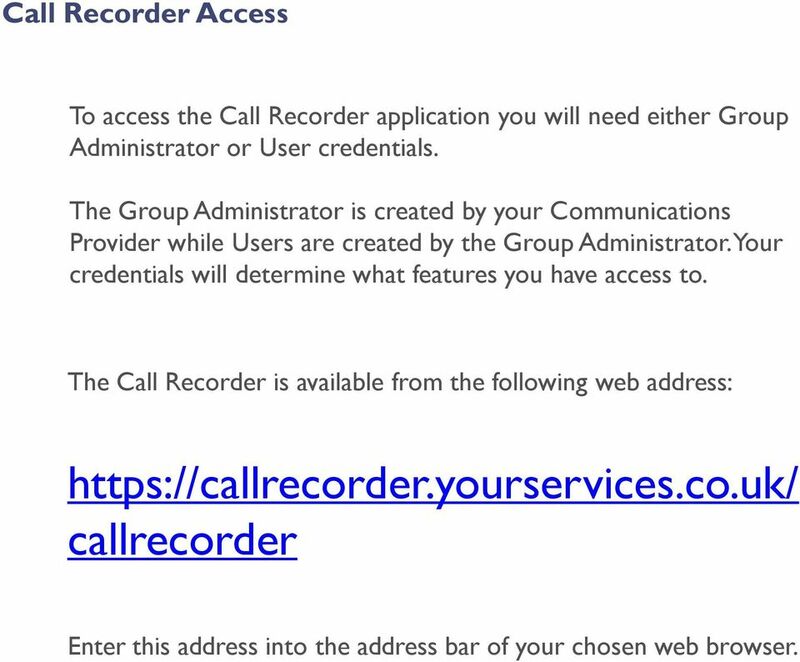 5 Call Recorder Access To access the Call Recorder application you will need either Group Administrator or User credentials. The Group Administrator is created by your Communications Provider while Users are created by the Group Administrator. Your credentials will determine what features you have access to. The Call Recorder is available from the following web address: callrecorder Enter this address into the address bar of your chosen web browser. 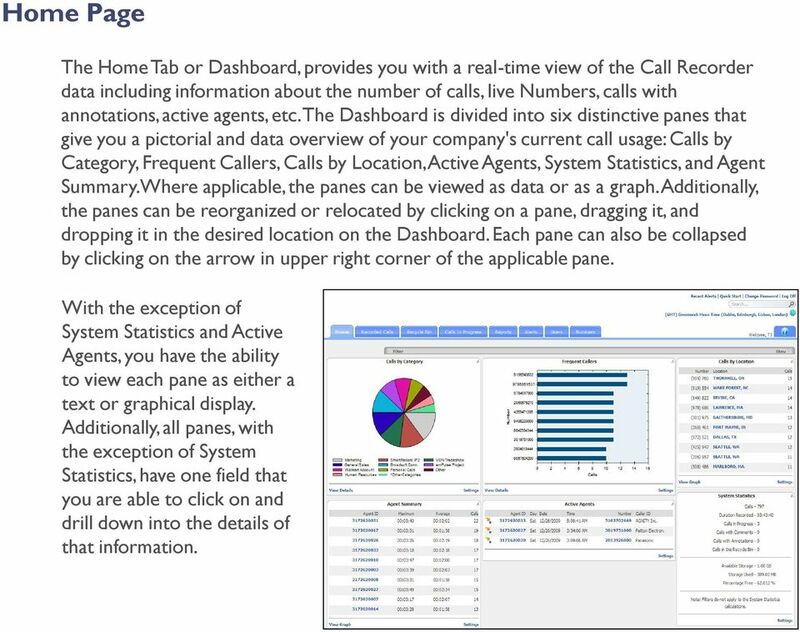 7 Home Page The Home Tab or Dashboard, provides you with a real-time view of the Call Recorder data including information about the number of calls, live Numbers, calls with annotations, active agents, etc. The Dashboard is divided into six distinctive panes that give you a pictorial and data overview of your company's current call usage: Calls by Category, Frequent Callers, Calls by Location, Active Agents, System Statistics, and Agent Summary. Where applicable, the panes can be viewed as data or as a graph. Additionally, the panes can be reorganized or relocated by clicking on a pane, dragging it, and dropping it in the desired location on the Dashboard. Each pane can also be collapsed by clicking on the arrow in upper right corner of the applicable pane. With the exception of System Statistics and Active Agents, you have the ability to view each pane as either a text or graphical display. Additionally, all panes, with the exception of System Statistics, have one field that you are able to click on and drill down into the details of that information. 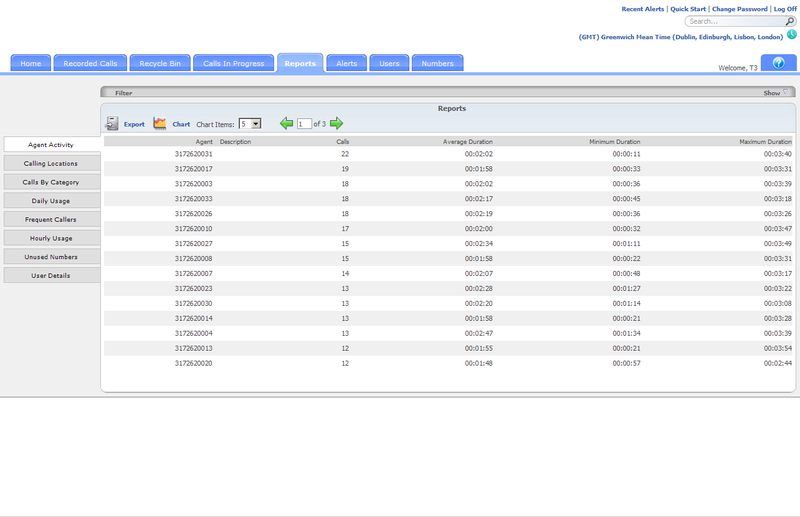 8 Recorded Calls Page Recorded Calls can be accessed by clicking on the Recorded Calls tab on the top menu bar. 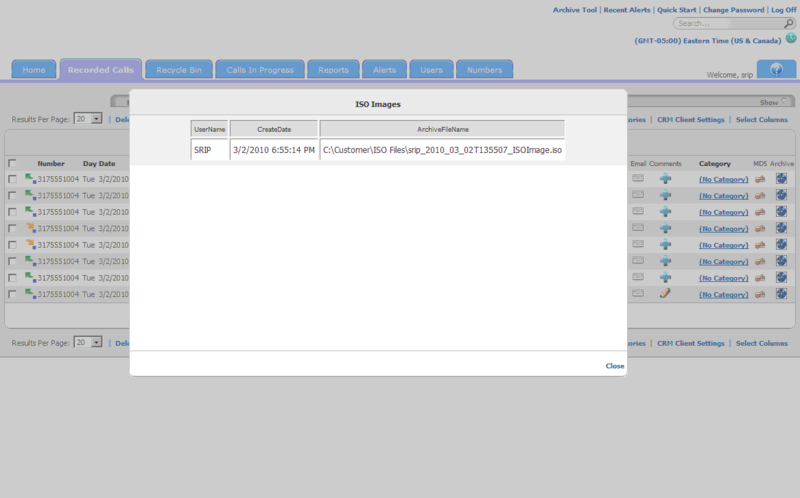 In order to better manage the Recorded Calls page, you are able to select which columns are useful to you and should actually appear on the page. 1. 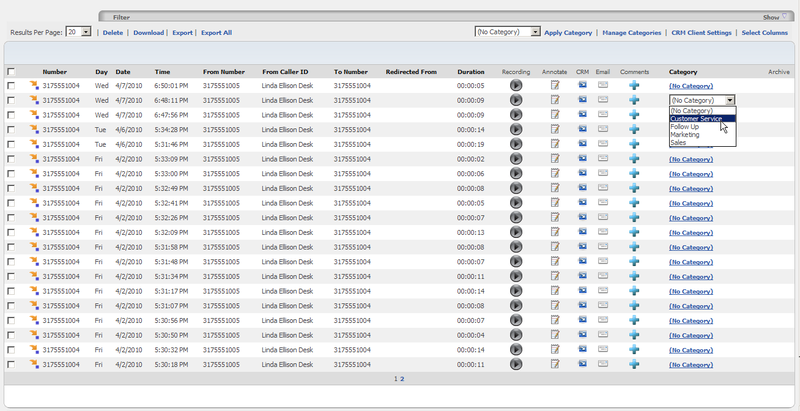 Select the Select Columns link at the top or bottom of the Recorded Calls page. 2. Select the following option boxes: Terminating Party Annotate Originating Party Category 3. Select the Update link. 9 Play a Recorded Call 1. Select a call and click on the icon that corresponds to that call. Your default media player will open and begin playing the recorded call file (MP3 file). The way in which media players load and play the recorded call files will vary. Some may require you to choose Play to start playing the recording. 2. 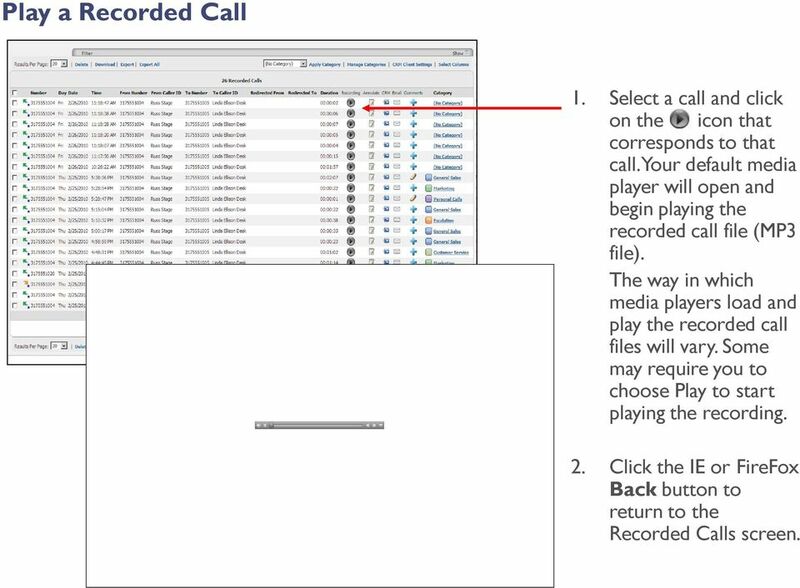 Click the IE or FireFox Back button to return to the Recorded Calls screen. 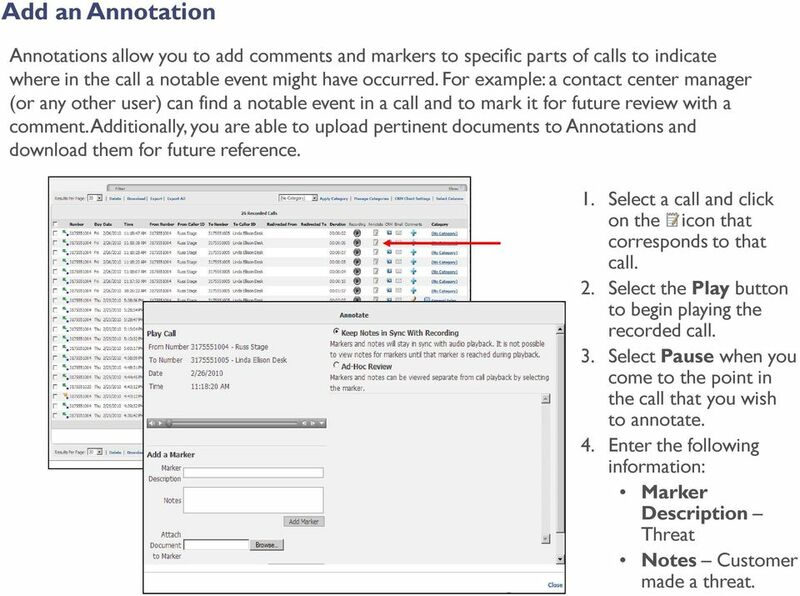 10 Add an Annotation Annotations allow you to add comments and markers to specific parts of calls to indicate where in the call a notable event might have occurred. 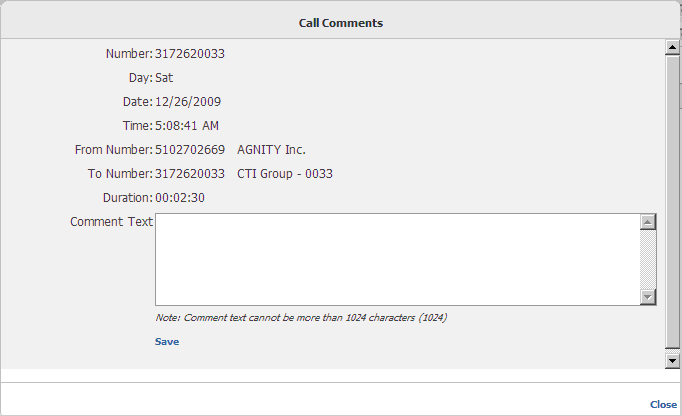 For example: a contact center manager (or any other user) can find a notable event in a call and to mark it for future review with a comment. 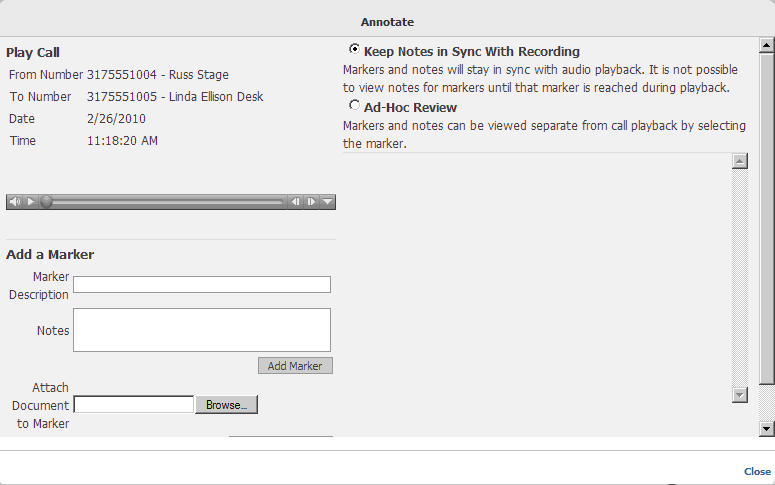 Additionally, you are able to upload pertinent documents to Annotations and download them for future reference. 1. Select a call and click on the icon that corresponds to that call. 2. Select the Play button to begin playing the recorded call. 3. Select Pause when you come to the point in the call that you wish to annotate. 4. Enter the following information: Marker Description Threat Notes Customer made a threat. 11 Add an Annotation 5. Click the Add Marker button. 6. 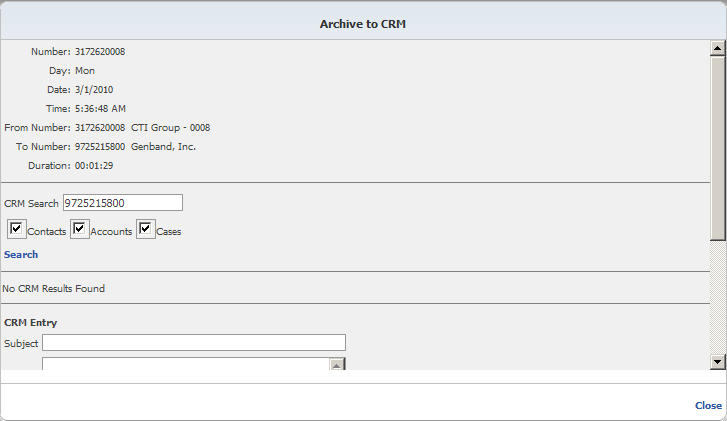 Click Browse next to the Attach Document to Marker field. 7. Select the document you wish to upload and associate with the annotation. 8. Click OK. 9. Click the Download Annotation link. 10. Select Open. 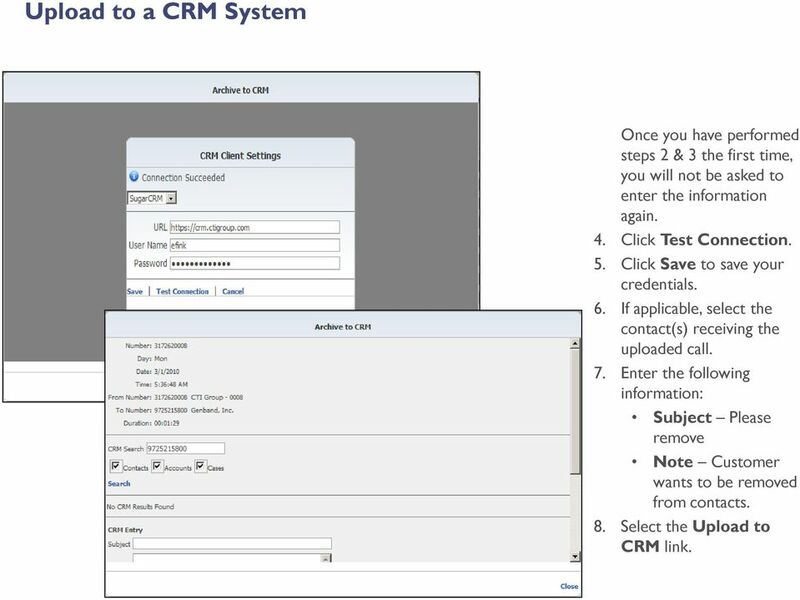 13 Upload to a CRM System Once you have performed steps 2 & 3 the first time, you will not be asked to enter the information again. 4. Click Test Connection. 5. Click Save to save your credentials. 6. If applicable, select the contact(s) receiving the uploaded call. 7. Enter the following information: Subject Please remove Note Customer wants to be removed from contacts. 8. 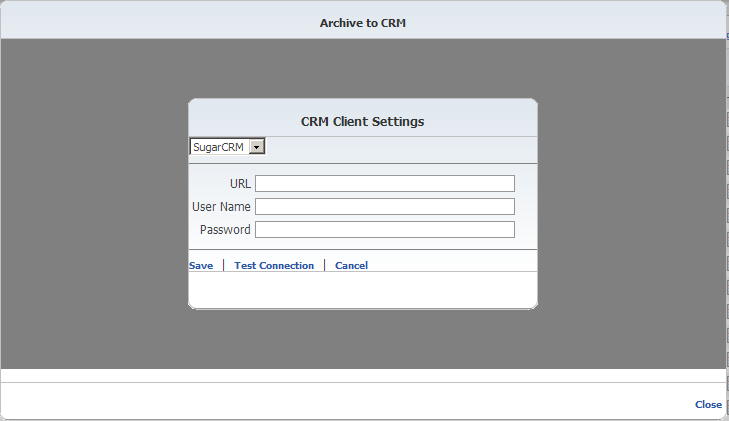 Select the Upload to CRM link. 14 a Recorded Call Situations will occur where you need to send a specific call recording to a person that may not have access to the application or just for emphasis. In these instances, you have the ability to the recorded call to that recipient. Although, there will not be an option for any calls that have been deleted. You will still see the call detail but there will not be a recording associated with it. 1. Select a call and click on the icon that corresponds to that call. 2. Enter the address(es) of the recipients. 3. Click Send. 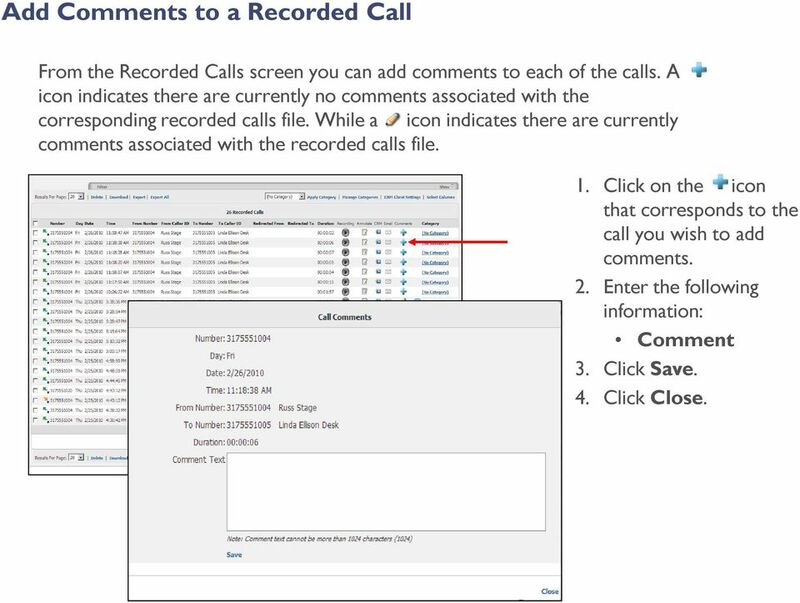 15 Add Comments to a Recorded Call From the Recorded Calls screen you can add comments to each of the calls. A icon indicates there are currently no comments associated with the corresponding recorded calls file. While a icon indicates there are currently comments associated with the recorded calls file. 1. Click on the icon that corresponds to the call you wish to add comments. 2. Enter the following information: Comment 3. Click Save. 4. Click Close. 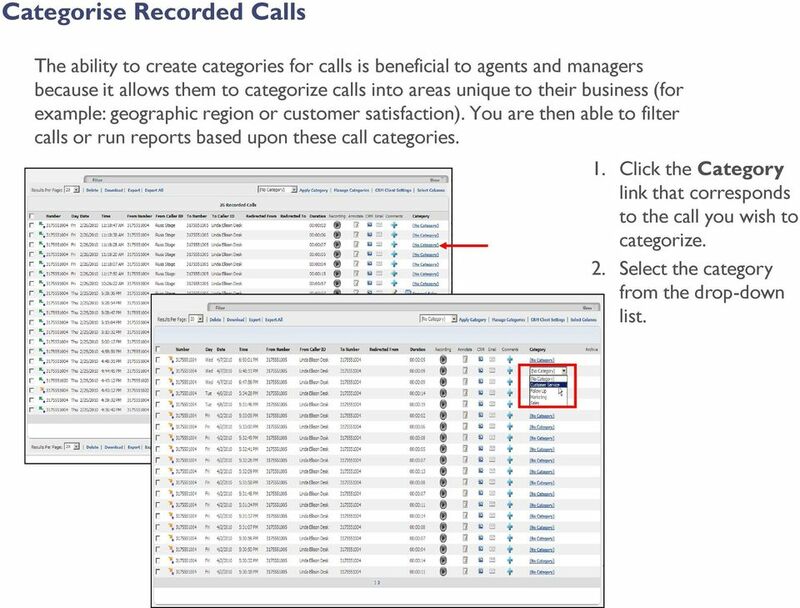 16 Categorise Recorded Calls The ability to create categories for calls is beneficial to agents and managers because it allows them to categorize calls into areas unique to their business (for example: geographic region or customer satisfaction). 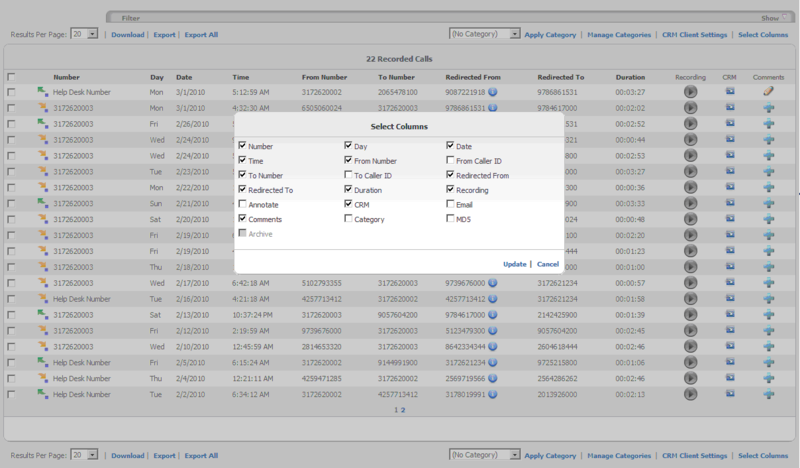 You are then able to filter calls or run reports based upon these call categories. 1. Click the Category link that corresponds to the call you wish to categorize. 2. Select the category from the drop-down list. 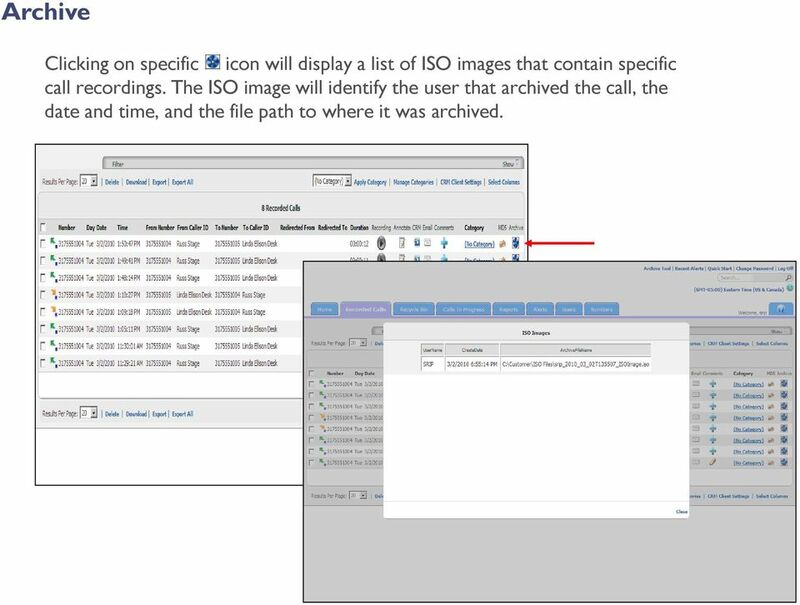 17 Archive Clicking on specific icon will display a list of ISO images that contain specific call recordings. The ISO image will identify the user that archived the call, the date and time, and the file path to where it was archived. 18 Recycle Bin The Recycle Bin is intended to be a "checks and balance" system when deleting recorded call files. When you delete a recorded call file, it is placed into the Recycle Bin. 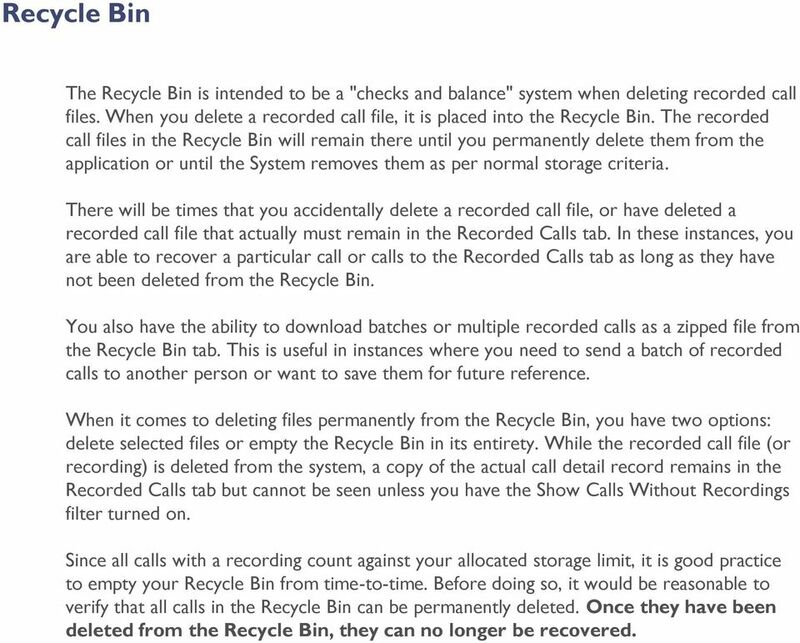 The recorded call files in the Recycle Bin will remain there until you permanently delete them from the application or until the System removes them as per normal storage criteria. There will be times that you accidentally delete a recorded call file, or have deleted a recorded call file that actually must remain in the Recorded Calls tab. In these instances, you are able to recover a particular call or calls to the Recorded Calls tab as long as they have not been deleted from the Recycle Bin. You also have the ability to download batches or multiple recorded calls as a zipped file from the Recycle Bin tab. This is useful in instances where you need to send a batch of recorded calls to another person or want to save them for future reference. When it comes to deleting files permanently from the Recycle Bin, you have two options: delete selected files or empty the Recycle Bin in its entirety. 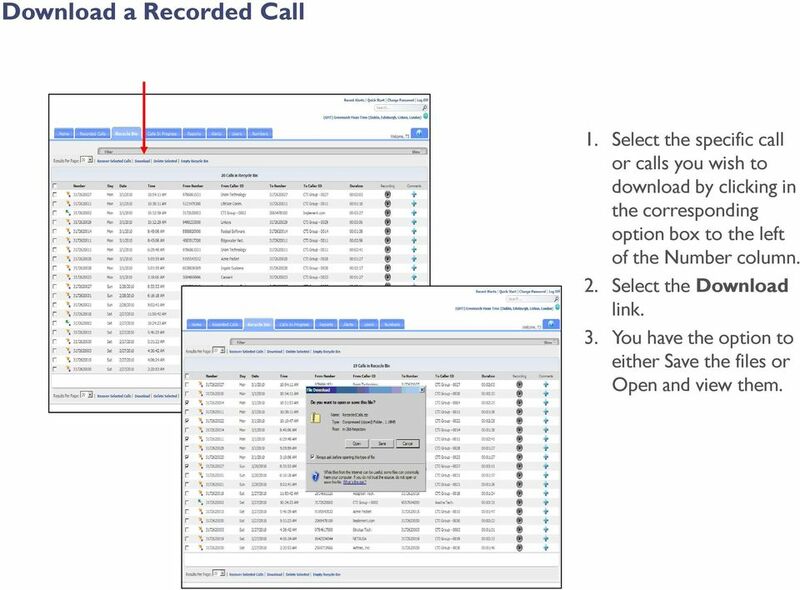 While the recorded call file (or recording) is deleted from the system, a copy of the actual call detail record remains in the Recorded Calls tab but cannot be seen unless you have the Show Calls Without Recordings filter turned on. Since all calls with a recording count against your allocated storage limit, it is good practice to empty your Recycle Bin from time-to-time. Before doing so, it would be reasonable to verify that all calls in the Recycle Bin can be permanently deleted. Once they have been deleted from the Recycle Bin, they can no longer be recovered. 19 Recover a Recorded Call 1. Select the specific call or calls you wish to recover by clicking in the corresponding option box to the left of the Number column. 2. Select the Recover Selected Calls link. The calls are recovered to the Recorded Calls tab. 20 Download a Recorded Call 1. Select the specific call or calls you wish to download by clicking in the corresponding option box to the left of the Number column. 2. Select the Download link. 3. You have the option to either Save the files or Open and view them. 21 Delete Recorded Calls (permanently) 1. Select the specific call or calls you wish to delete by clicking in the corresponding option box to the left of the Number column. 2. Select the Delete Selected link. 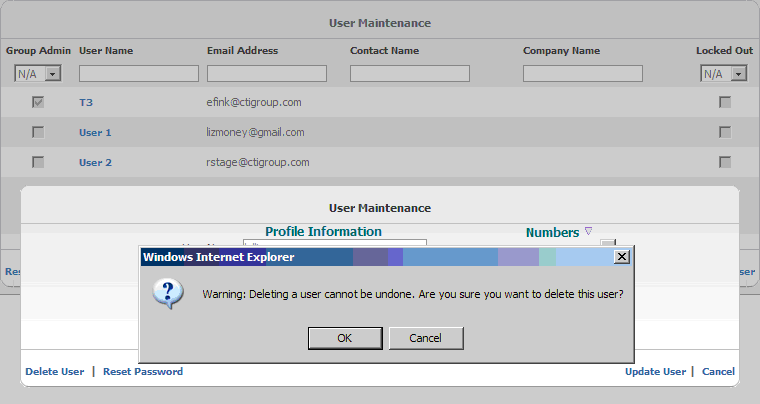 To delete all calls in the Recycle Bin, select Empty Recycle Bin. 3. Click OK.
23 Monitor a Call Monitoring a call is easy and can occur at any point in the call. Monitoring is used in situations such as: training, behavior issues, or legal reasons. The other participants in the call are never aware that it is being monitored. 1. Select the specific call you wish to monitor and click on the icon. 2. Click Open. 24 Record a Call in Progress By default, all calls to and from a Number are recorded and saved. The Group Administrator does have the option to override this default. For the calls that aren t set up to be saved, you can, on a one-time-basis, save them on the fly by clicking in the Save Recording option box while the call is in progress. 1. Click once in the option box of the call that you wish to record. A checkmark should appear in the option box. Clicking in the Save Recording option box will only record this call. It will not record all calls going forward for this Number. 25 Add Comments to Calls in Progress From the Calls in Progress screen you can also add comments to each of the calls. A icon indicates there are currently no comments associated with the corresponding calls in progress call file. A icon indicates there are currently comments associated with the corresponding call file. 1. Click on the icon that corresponds to the call you wish to add comments. 2. Enter the following information: Comment 3. Click Save. 4. Click Close. 26 Categorize Calls in Progress The ability to create categories for calls is beneficial to agents and managers because it allows them to categorize calls into areas unique to their business (for example: geographic region or customer satisfaction). 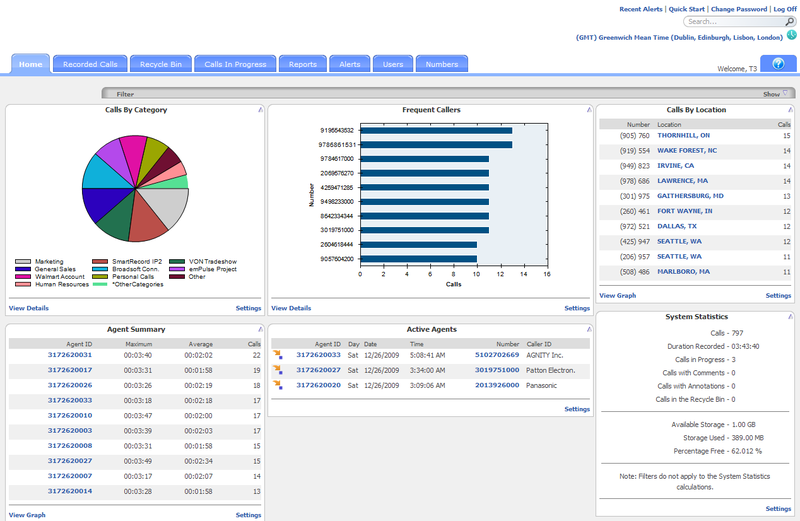 You are then able to filter calls or run reports based upon these call categories. 1. Click the Category link that corresponds to the call you wish to categorize. 2. Select the category from the drop-down list. 27 Reports There are eight reports included in the application that assist the user with administration activities. The reports identify information that can be found on the dashboard, or Home tab, but in more detail. 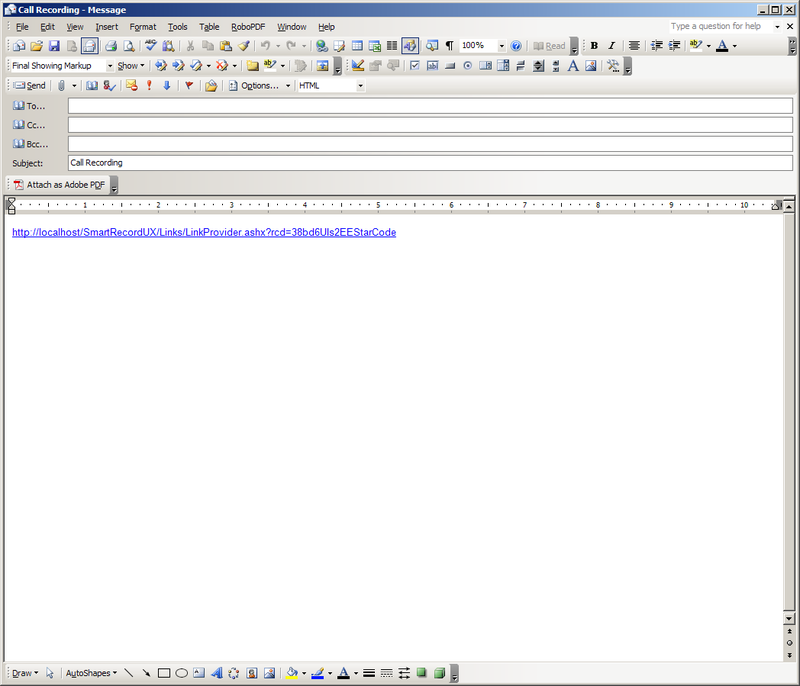 Reports can be viewed as text or in a graphical format. You also have the ability to export reports and save them to your own PC. 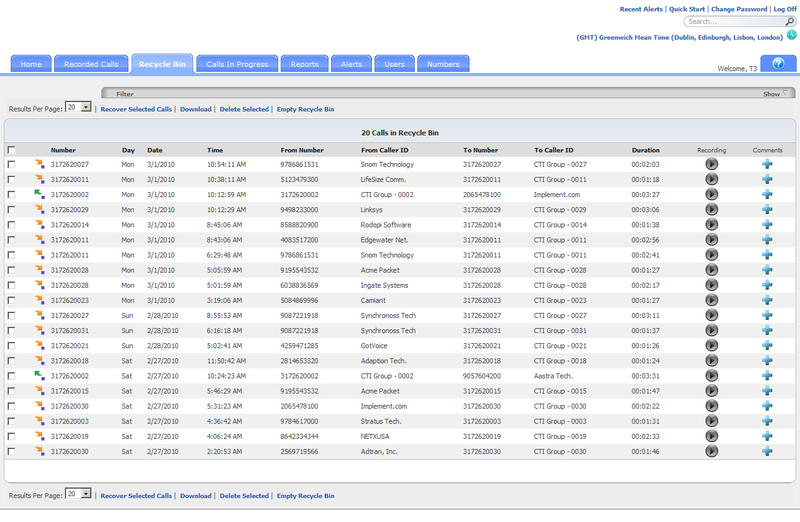 Additionally, you can filter on information in the reports such as number, date, and time. 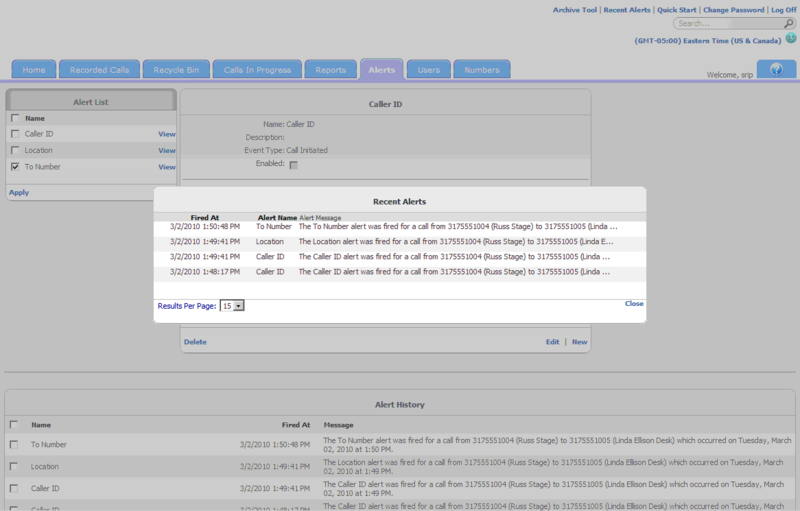 28 Alerts Alerts can be created based on specific call conditions. When those conditions are met, you will be notified via with the pertinent details, so that you can address any issues or make any necessary changes to current policies or procedures. Additionally, a history of the alerts that have executed is available from the Alerts tab. You can also view any recent alerts by clicking on the Recent Alerts link on the top right side of the end user application window. Alerts will be temporarily disabled if they begin to cause excessive logging/ ing resulting in possible network congestion. In such cases, an will be sent to the owner of the alert. Additionally, the Alerts tab displays a list of alerts that have occurred under the Alerts History section. You have the ability to clear the Alert History by selecting the alert(s) and clicking the Clear Selected link. You can also view a list of recent alerts by clicking on the Recent Alerts link located at the top of the application page. 29 Create an Alert For example: 1. Enter the following information: Name Emergency Calls Description This alert is for emergency calls. 2. Select Call Initiated as the Event Type. 3. Verify the alert is Enabled. 4. Select Alert on any day. 30 Create an Alert (example continued) 5. Enter or select the following information: Start Time 00:12:00 a.m. End Time 00:12:00 p.m. Time Zone (GMT -05:00) Eastern Time (US& Canada) Originating Digits Equal to Select a category from the Add a Category drop down list. 7. Enter the following information: Add a Comment These calls are emergency calls made from within the building. 8. Select by clicking in the option box. 9. Select Save. 31 Disable an Alert The obvious reason that an alert is disabled is that it is no longer being used. Another less obvious reason, an alert is temporarily disabled by an Administrator because it was causing too many s to be sent out, potentially causing congestion on the server. Since alerts can be reused, they should not always be deleted. If an alert was temporarily inactivated because too many s were being generated, the alert should be edited before it is reactivated. 1. Click in the Active option box that corresponds to the alert. 2. Select Apply. 32 Delete an Alert 1. Select the View link that corresponds to the alert. 2. Select Delete. 3. 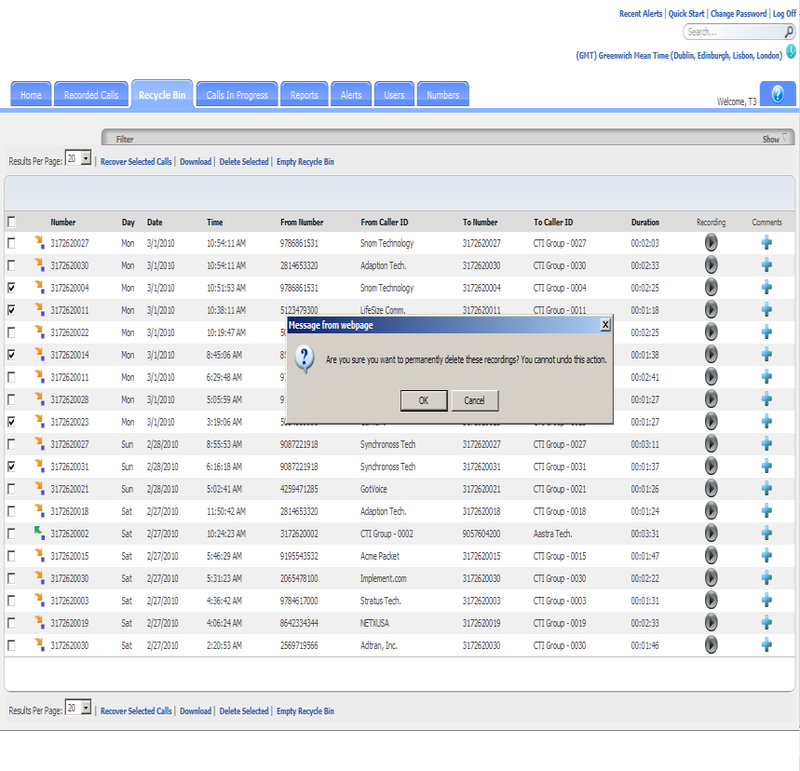 Select OK.
33 Recent Alerts You can view up to 20 of the most recent alerts by clicking on the Recent Alerts link on the top right side of the end user application window. The default view is to show 15 recent alerts, however, you can change the default by clicking on the Results Per Page drop down and selecting from the available options. While you have this dialog box open, you will be notified of any new alerts. 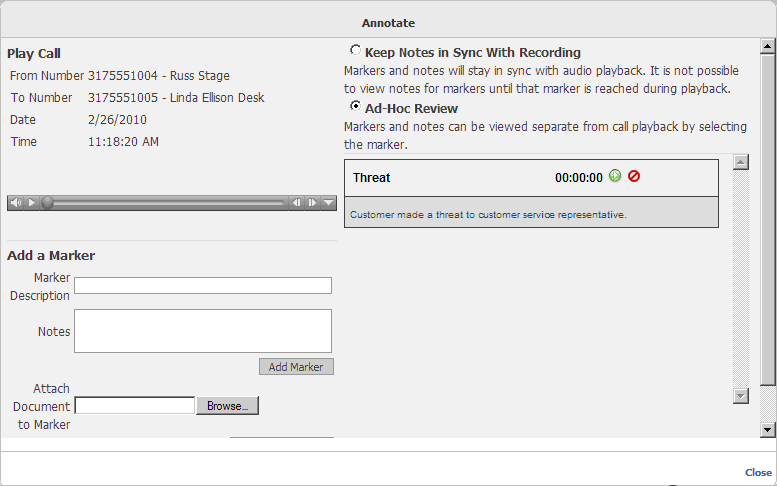 New alerts will first appear at the bottom of the dialog box and you will also hear a chime. 34 Users In order to view recordings, Users must first be added and have specific Numbers assigned to them. Only the Group Administrator has the ability to add new Users to the application. When a new User is added, the system will automatically them a password. User s have the ability to change their passwords at anytime. However, in the event that they forget their password, they can come to the Group Administrator at which time their password can be reset from the User Profile Information screen. 36 Add a User 3. Select at least one Number to associate with the User by clicking in the corresponding option box. NOTE: The Number(s) you select here will be the Number(s) that the user can access 4. Click Add User. 37 Reset a User s Password 1. Select the user and click on the Login ID. 2. Select Reset Password. 3. Click OK. The User s password will be ed to them. 38 Delete a User At times you may find it necessary to delete Users because they have left the company or to replace them with new Users. 1. Select the User and click on Login ID. 2. Select Delete User. 3. Click OK.
39 Numbers Numbers are assigned by your Communications Provider when the Group Administrator is created. It is then the Group Administrator s responsibility to identify the recording criteria for each Number and assign the Numbers to Users via the Call Recorder. Recording criteria includes the following: Number - Identifies the Number. This information is automatically entered by the application. Description - If applicable, provides a description for the Number. For instance who it belongs to or where it is located. 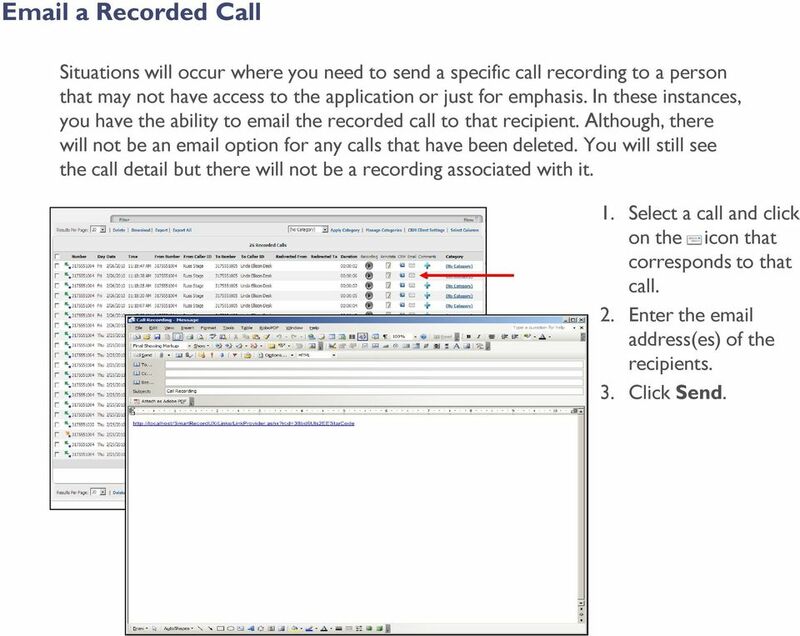 Do Not Retain Recording - Identifies whether or not recordings from this Number will be retained each time a call occurs. 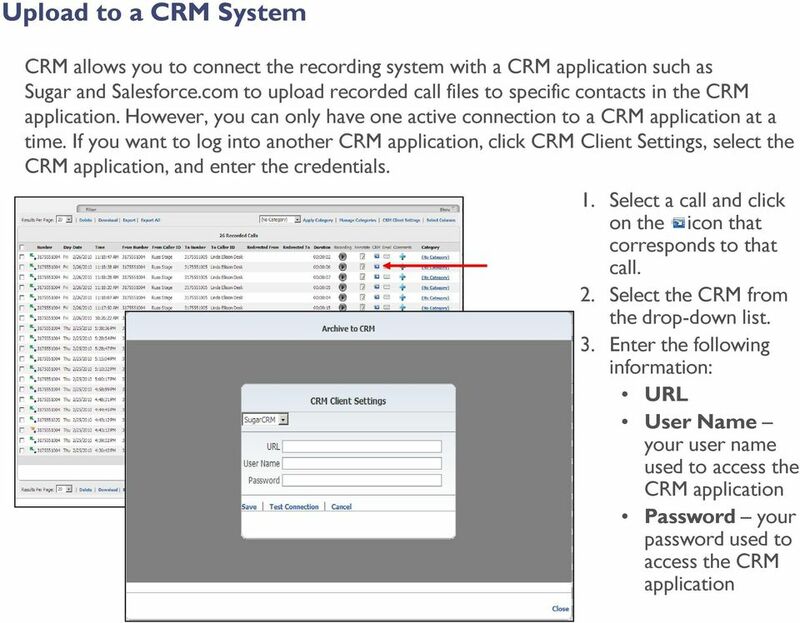 The recordings will be retained each time a call occurs if a checkmark does not appear in the option box. 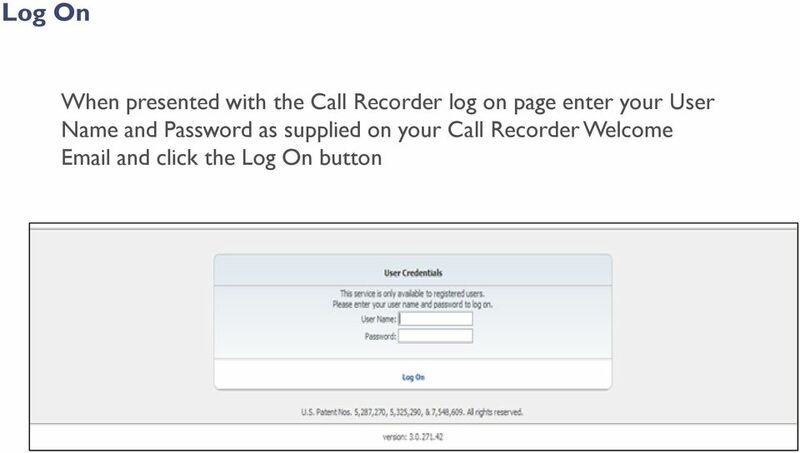 The recordings will not be retained each time a call occurs if a checkmark does appear in the option box. 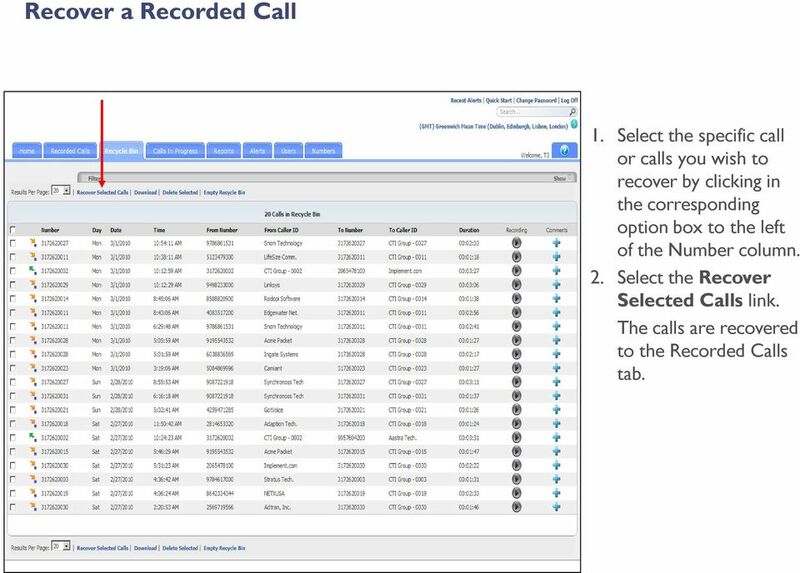 Only Record Calls From -Identifies a specific number or numbers from which calls should be recorded. For example: Every time the incoming number identified in this field calls my number, the system should record the calls. The wildcard % (percent) can be used in place of a number. A _ (underscore) is identified as a single character substitution. The, (comma) and ; (semicolon) can be used as delimited values if you would like to apply two or more rules. 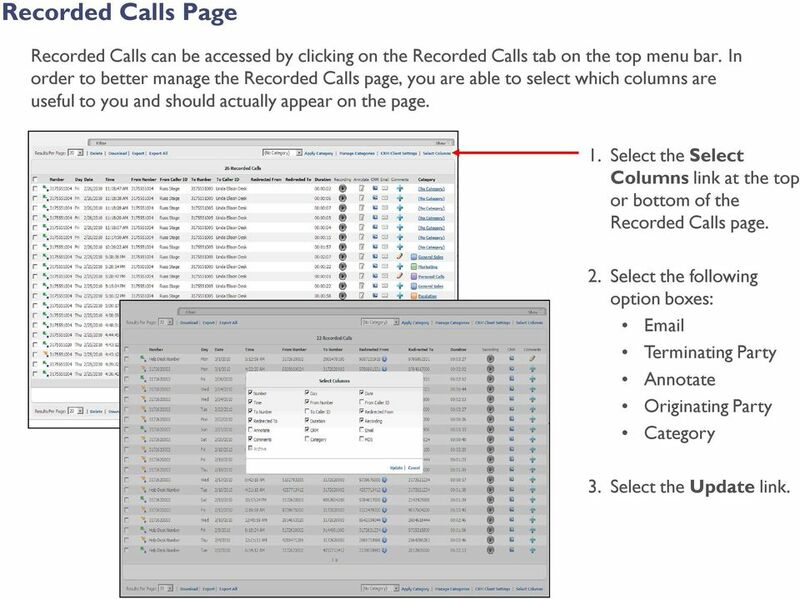 Only Record Calls To - Identifies a specific number or numbers to which calls should be recorded. For example: Every time the outgoing number identified in this field is called from my number, the system should record the calls. The wildcard % (percent) can be used in place of a number. A _ (underscore) is identified as a single character substitution. The, (comma) and ; (semicolon) can be used as delimited values if you would like to apply two or more rules. 40 Numbers Only Record Calls to Caller ID - Identifies a specific person, people, or place (the actual text part or ID) from which calls should be recorded. For example: Every time the name or ID identified in this field calls my number, the system should record the calls. The wildcard % (percent) can be used in place of a number. A _ (underscore) is identified as a single character substitution. The, (comma) and ; (semicolon) can be used as delimited values if you would like to apply two or more rules. Only Record Calls To Caller ID - Identifies a specific person, people, or place (the actual text part or ID) to which calls should be recorded. For example: Every time the outgoing name or ID identified in this field is called from my number, the system should record the calls. The wildcard % (percent) can be used in place of a number. A _ (underscore) is identified as a single character substitution. The, (comma) and ; (semicolon) can be used as delimited values if you would like to apply two or more rules. Inbound (Percent of Calls to Record) - Percent of inbound calls to record for this number. Range values are 0-100%. The default is 100% Outbound (Percent of Calls to Record) - Percent of outbound calls to record for this number. Range values are 0-100%. The default is 100%. Record Start Time - It may only be necessary to record for a certain time range during the day. 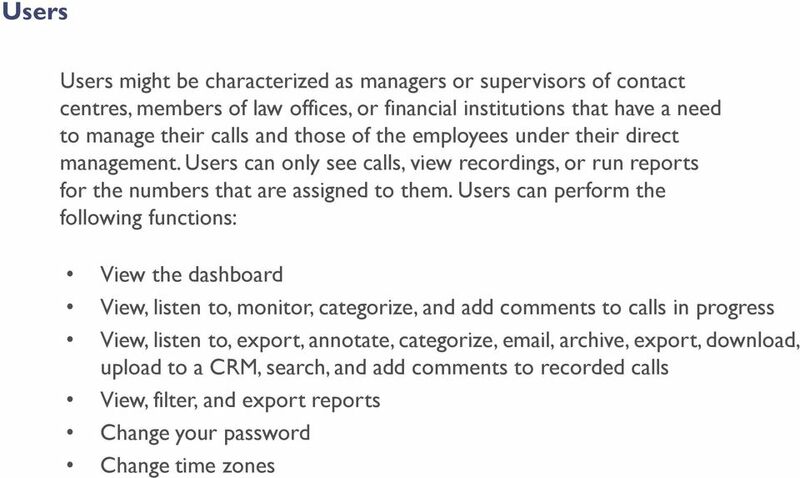 In this case, you can designate a specific time of day to begin recording calls. Record Stop Time - Designates a specific time of day to stop recording in the event you have designated a record start time. Time Zone - Identifies the time zone in which the calls will be recorded. Days of week to record - Identifies specific days of the week on which to record calls for a particular number. 41 Update Number Criteria 1. Click on the number you wish to update. 2. Enter or select the criteria 3. Click Update Number. 42 Exclude a Number from Recording 1. Click on the number you wish to exclude from recording. 2. 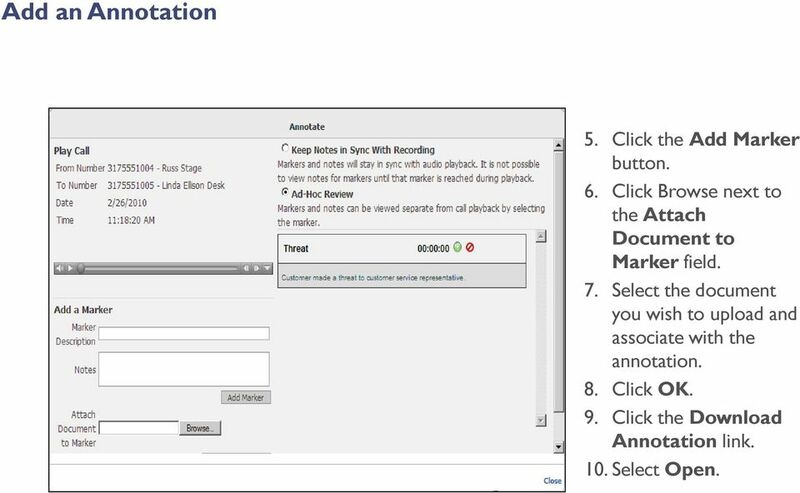 Select Do Not Retain Recording by clicking in the option box. 3. Click Update Number. A checkmark will appear in the option box. 43 Copy Number Details The Number Information screen can become quite cumbersome. If you are entering 50 new Numbers, this process could take you all day. However, when Numbers have the same criteria, you can use the Copy Number Details function to copy the details of one Number to one or more other Numbers. 1. Select the Copy Number Details link from the top or bottom of the Numbers page. 2. Select the Number that you want to copy from the Copy Number Profile From dropdown list. 3. 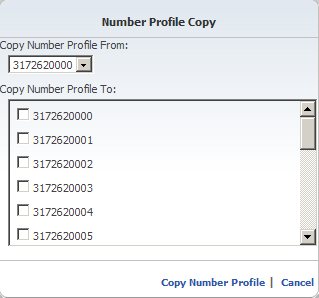 Select the Number that you want to copy to from the Copy Number Profile To drop-down list. 4. Click Copy Number Profile. 44 Change Your Password Group Administrators have the ability to create User s. User s passwords are auto-generated by the application and ed to you once the new account is saved. If you lose your password and have to have it reset, it is auto-generated and ed as well. However, you have the ability to change your password to something more meaningful to you. Select the Change Password link. Enter your old password, new password, and confirm your new password. Click Submit and then OK.
45 Apply a Filter Number, Date, Duration, or Category (or a combination of all four) filters or advanced searches located below the Home, Recorded Calls, Recycle Bin, Calls in Progress, and Reports navigation tabs can be applied to the screen to assist in searching and displaying only the information pertinent to your current needs. Note: You do not have the option to filter by category under the Reports tab. For example: 1. Select the By Date/Time tab. 2. Select Yesterday from the drop-down list. 3. Click Apply Changes to apply the filter. 46 Searching The Search feature allows you to search any part of the call record (Number, Duration, Time, Comments, etc.) on the Recorded Calls screen in order to find a specific call record. For example: if there are 10 pages of recorded call files on the Recorded Calls screen and I need to find a specific call record that I know has a comment associated with it that has the word helpdesk in it, I can search for that word to find that call record. You can also use a wild card (%) to replace part of the word or Number for which you are searching. For example: 1. Type the word Customer in the Search field. 2. Click the View Search Results link. vrecord User Manual Vegress Record 2.0 (vrecord) page 1 of 10 Vegress Record (vrecord) vrecord overview.. 3 How to log in. 3 vrecord navigation bar 4 Update your password 5 Outgoing / Incoming Call window..